Ms. Griffin assumed the position of Minister Counselor for Commercial Affairs at the U.S. Embassy in Beijing in September, 2017. A member of the Senior Foreign Service, Ms. Griffin most recently served as U.S. Consul General in Perth with responsibilities for Western Australia (2013-2016). 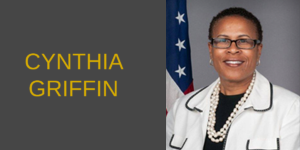 Ms. Griffin served as Regional Director, Western Hemisphere for the U.S. Commercial Service in Washington, DC (2011-2013), where she oversaw the operations of 14 offices throughout North America, Central America, and South America. Prior to her Washington assignment, Ms. Griffin served as Commercial Counselor in Bangkok, Thailand (2008-2011), as Regional Senior Commercial Officer for West & Central Africa (2004-2007) based in Dakar, Senegal, and as Regional Senior Commercial Officer for East Africa based in Nairobi, Kenya (2001-2004). Ms. Griffin began her career at the American Institute in Taiwan where she served as Commercial Attaché (1995-1998). From 1998-2000, she served as a Senior International Trade Specialist advising U.S. exporters. Originally from Connecticut, Cynthia speaks Mandarin Chinese and French, and is proficient in Thai. She holds a B.A. in Chinese & Asian Studies, from Connecticut College, and an M.A. and post graduate degree in China Studies from the Johns Hopkins University, Nitze School of Advanced International Studies, and the Hopkins Nanjing Center. More recently, she attended Harvard University, John F. Kennedy School of Government, Executive Education program. She has two college-aged daughters.